Anchored wall simply supported at heel is analyzed as a continuous beam using the deformation variant of the finite element method in order to comply with the assumption of simply supported structure at heel. The actual analysis is preceded by the determination of load due to earth pressure applied to the structure. The pressure acting on the back of a structure is assumed as active presure, while the front face is loaded by passive pressure. inputting an arbitrary distribution of earth pressure up to the depth of zero point (this way it is possible to introduce an arbitrary redistribution of earth pressure). 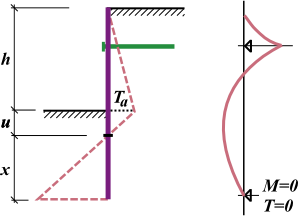 For simply supported structures it is assumed that the moment and shear force are zero at the heel. The program first places the end of a structure into the zero-value point, and then it looks for the end beam location x, where the above condition is fulfilled (see Fig.). Solution procedure for multiplied anchored walls is identical.